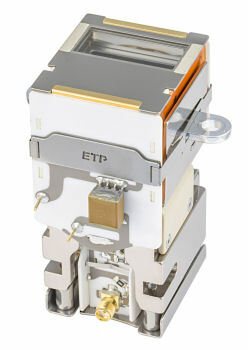 By improving electron-optical efficiency, ETP have developed a NEW range of detectors with vastly superior detector life. ETP’s detectors can last up to ten times longer than current detectors. Extended detector lifetime enables more stable gain operation. Less frequent instrument calibration enables the end user to focus on running samples and not the operation of the mass spectrometer. ETP’s ion detection systems are known to have the highest linear dynamic range available. Discrete dynode technology can be adapted to enable wider dynamic range making it the superior choice compared to single piece glass channeltron devices. To meet the demands of mass spectrometry miniaturisation, ETP have combined new technologies to develop a range of mini and micro ion detection systems for quadrupole and TOF instruments.